Linotype refers to a machine, power-driven, and manually-operated, that produces composed type on metal bars called slugs. Created and sold by the Mergenthaler Linotype Company, its first operation began in 1886 at the New York Herald Tribune. The word “line-o-type” derives from the fact that the machine produces an entire line of metal type at one time. An operator enters text on the keyboard and the machine assembles the matrices (small brass units having characters indented in the edges), which are molds for the letterforms in a line. The assembled line of text is cast as a single piece, known as a slug. The matrices are reused later if needed. The machines set type in hundreds of languages and dialects for books, periodicals, newspapers, and advertisements. The operator of the machine converted copy (typewritten or handwritten) into new type and cast type slugs. 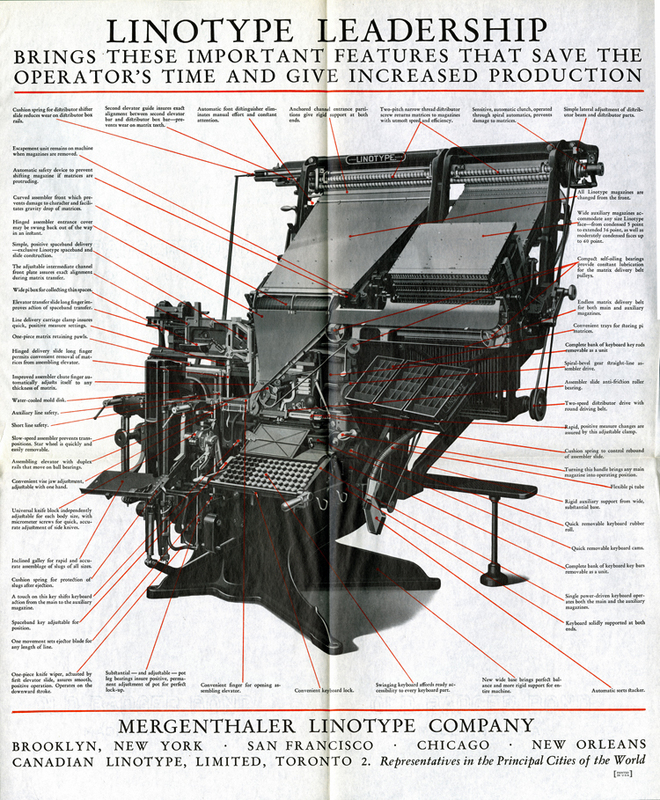 With so many Linotype machines in operation by the early twentieth century, the Mergenthaler Linotype Company recognized the need for schools and training for its operators. The San Francisco office of Mergenthaler had one of the largest schools for Linotype owners who sent their employees, but independent individuals seeking to qualify themselves as operators and machinists were also welcome to attend. Other schools were located throughout the United States in Boston, Chicago, New Orleans, and Portland, Oregon, at the Jefferson High School, the first course of its kind in a public school (1914). The Washington, DC Linotype School under the tutelage of William H. Stubbs of the Baltimore Sun, guaranteed a speed of 4,000 ems per hour—and ems per hour mattered. Stubbs knew this well, being a champion operator on the Linotype. In 1900, Stubbs averaged an astonishing 12,350 ems an hour. According to the Bureau of Labor Statistics, in 1928 the productivity of labor in newspaper printing deadlines for Linotype and intertype operators in specified cities in the United States varied from 3,300 ems to 7,500 ems. Presumably the more “ems” one could set, the more employable one was. Mergenthaler valued its operators and it expanded training so that by the 1940s, the company had even more robust course offerings including color combinations, handling paper, selection of stock and printing design, and platen presswork. The 1930 diagram of a Linotype machine above conveys the complexity of the machine and why instruction was a necessary requirement of any operator. Other aspects of the Linotype machine, especially the development of typefaces and fonts by designers such as Matthew Carter, William A. Dwiggins, Chauncey H. Griffith, Rudolph Ruzicka, and Hermann Zapf; typeface specimens; and business records are well documented in the Mergenthaler Linotype Company Records found in the Archives Center at the National Museum of American History. Gage, Harry L. Vocational and Professional Monographs, Linotype Operation, 1947. The Inland Printer, April 1918, page 650. Linotype Bulletin, Volume 14, December 1917. Linotype Bulletin, Volume 15, January-February 1921. Linotype Bulletin, Volume 17, 1921. Typographical Journal, Volume 22, 1903. Bulletin of the United States, Bureau of Labor Statistics, Wages and Hours of Labor in Foundries and Machines Shops 1927, December 1928.